In continued protest of Donald Trump and his presidential campaign, Ilegal Mezcal is inviting voters around the world to take #AShotAtDonald and make a change. 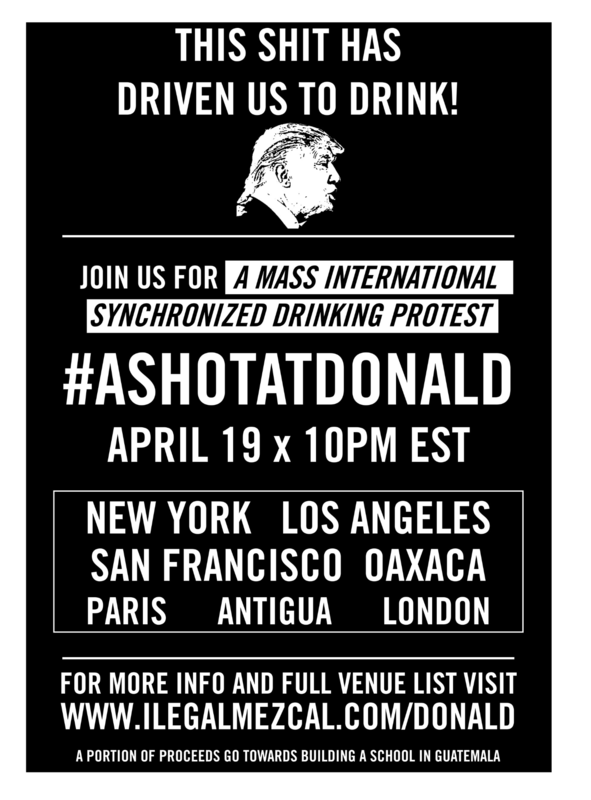 Today at 10pm EST on Tuesday, April 19, bars in New York, Los Angeles, San Francisco, Seattle, Miami, Guatemala, Oaxaca, London and more will be staging a mass synchronized drinking protest. Patrons in each participating bar will take a synchronized shot in a stand against the presidential candidate. If simply protesting The Donald isn’t reason enough to participate, the shots are also helping to build a school in Guatemala. For every protest shot taken at participating venues, Ilegal Mezcal will donate $1 to Niños de Guatemala, nonprofit organization working to break the cycle of poverty in Guatemala by investing in education for children who otherwise would not have the opportunity to receive formal schooling. The mezcal brand initiated their campaign against the presidential candidate over the summer, after he made some careless and insulting remarks about the Mexican-American and Latin-American communities. As his candidacy gains support so do the “Donald Eres Un Pendejo” posters, projections, and t-shirts. Whether you’re taking a shot at Donald, taking a shot for the kids, or both, join Ilegal Mezcal on Tuesday, April 19 at 10pm EST. For additional information about participating bars, please visit http://www.ilegalmezcal.com/donald. Tags: bars, Belle Shoals, Illegal Mezcal, latin, Mexico, mezcal, new york, nyc. Bookmark the permalink.